Expect more of this in the weeks ahead. Aaron Rodgers is arguably the greatest quarterback of all time,1 so it’s hard to imagine that there could ever be too much Rodgers in a game plan. Yet this seemed to be the problem for Mike McCarthy and Green Bay through the first nine weeks of the season. On Sunday, though, the Packers flipped the script for a 31-12 victory against the Miami Dolphins, a win keyed by one of the best rushing performances in the Rodgers era. The Packers entered Week 10 last in the NFL in share of running plays on first down (39.6 percent) despite being second in the league in play success on those runs (48.5 percent).2 But on Sunday, they ran on more than half of their first downs (51.85 percent) and gained 142 yards on their 14 carries, including 117 yards on nine carries by Aaron Jones. On Sunday, the Packers weren’t just taking advantage of a soft run defense to make this kind of structural change: Miami entered the game in the middle of the pack in play success allowed to opponents running on first down. Instead, a renewed focus on the run has been in the works in Green Bay for several weeks. Just giving the ball to Jones was a massive step in the right direction for Green Bay. He only recently became the Packers’ primary running back. After serving a suspension the first two games of the year for a substance abuse violation, Jones split snaps with Ty Montgomery and Jamaal Williams largely because of the Packers’ passing emphasis. McCarthy saw him as an incomplete running back because of his shortcomings as a blocker and as a receiving threat. “There’s more to playing the position than just running the football,” McCarthy said in early October. And that’s especially true if running the football is not remotely a point of emphasis for a team. While NFL teams generally run too much — especially on first down — it’s a problem specifically when defenses are geared to stop the run. But that’s not the case for teams facing Green Bay. Like Kamara and the Saints last year, Jones has a quarterback whom defenses fear so much that they don’t dare put an extra defender in the box to stuff the running back. This season, the Packers have faced eight or more defenders in the box on first down just eight times in 272 snaps, a league-low rate of 2.94 percent (8.75 percent is average). Defenses are pretty much willing to concede the run — similar to how teams defend the Los Angeles Rams, who face stacked boxes almost as infrequently (3.8 percent). 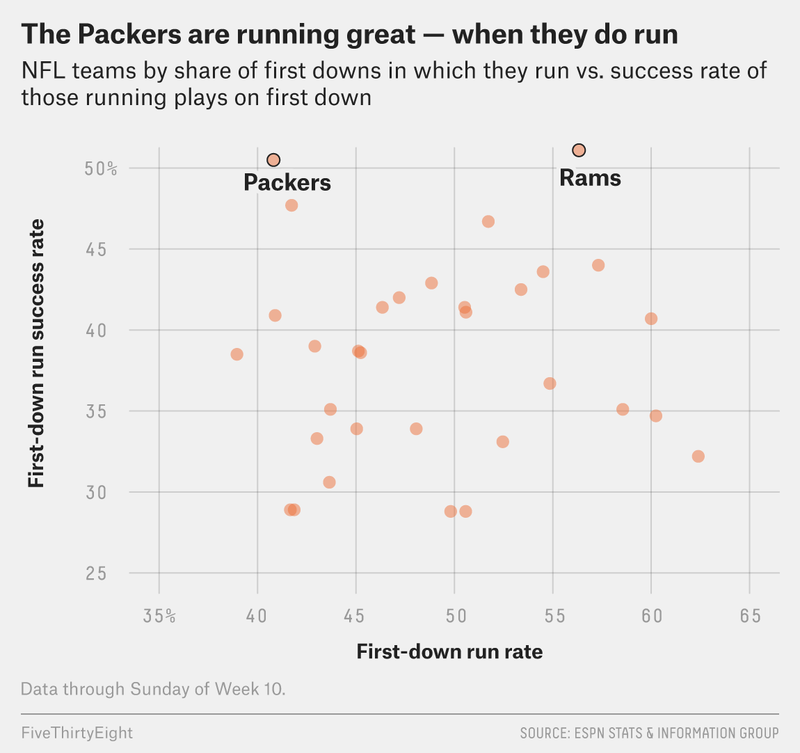 But the Rams, who are the only team better than the Packers in rushing success rate (51.1 percent), run the ball on first down 56.3 percent of the time, including 49.4 percent in the first half, when the score of the game is less likely to influence these play calls. Can the Packers, at 4-4-1, maintain this newfound offensive balance and ride their running ways to the postseason? Their first test will be Thursday at Seattle before they travel to Minnesota in Week 12 in a game that could determine an NFC wild-card spot. The promos and advertisements for that Sunday Night Football contest will spotlight Aaron Rodgers, but the Packers featuring less of him may be the key to getting that victory. By career quarterback passer rating, he is. A successful first-down play is defined as getting a first down or touchdown or gaining at least 40 percent of the yardage needed to convert a first down.